I tried to pay by credit card,but It failed because AVS system does not resist my adress in English,mabye. DC Card credit card service senter called me ,and said my authorization data have been passed(sucseeded) 14 times in DC card authorization senter in Japan. But they don't if the data was passed or failed in U.S. I think Japanese credit card adress is not in English ,I don't know if this card can pass in your system. But I tried many times,and passed 14 times ! ($595*14times),because your web site showed me " FAILED". 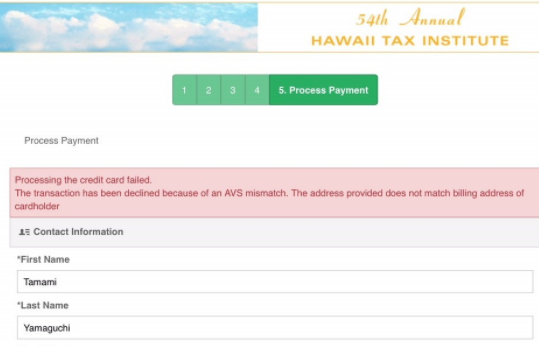 DC Card staff said ,"Please ask Hawaii institute,and we want to get failed data to cancell of transaction ." I'm in Japan now and I'll be to Honolulu at 11/2 PM. I think I can call after arrive in Honolulu. If possible ,I want to speak in Japanese. So far, you have not registered for the institute so no credit card charges have been made by us. We suggest that you call your credit card company and tell them to cancel those charges. You can come to the institute and you can register at the registration desk and pay with your credit card at that time.